Enter your interactions and contact reports directly into EverTrue*! 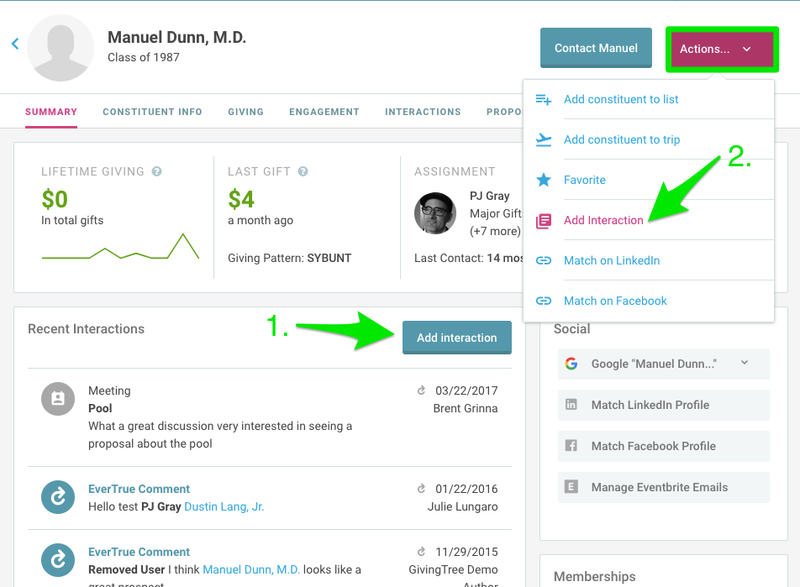 The format for writing interactions in EverTrue is set by your institution's EverTrue administrators alongside our implementation team. All interaction types and optional details are customized to your institution. To learn how to write interactions on your mobile device, see here. 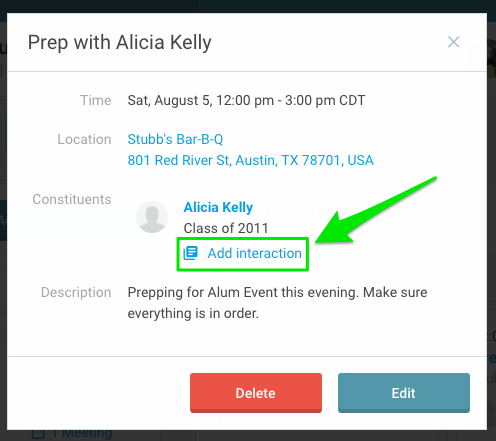 You have two options for adding an interaction from a constituent profile. Use the 'Add Interaction' button on the Summary screen. Use the Actions menu in the upper-right corner and select 'Add Interaction'. To add an interaction to a trip (as a whole), use the Actions drop-down menu in the upper-right corner and select 'Add Interaction'. 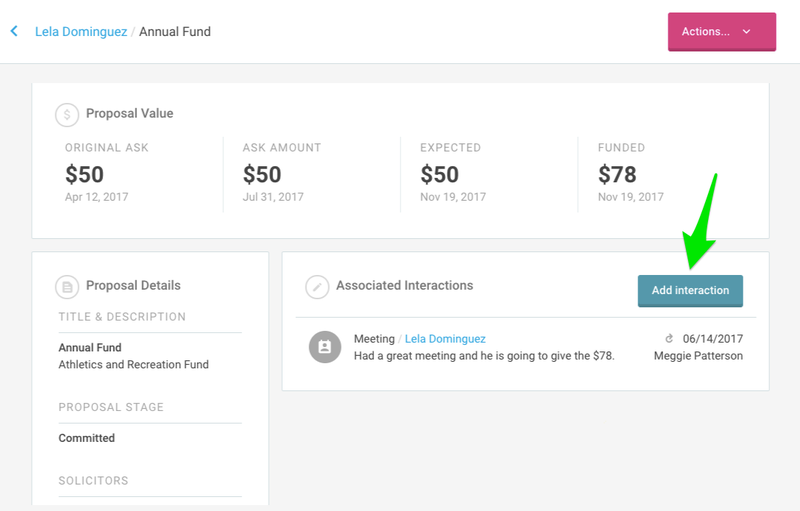 You can also add an interaction from any specific meeting. Click on your meeting and select 'Add Interaction' to get started. Both methods of adding an interaction will open up the interactions module, which allows you to add your details. Only constituents included in your Trip List can be added to an interaction created through a trip. 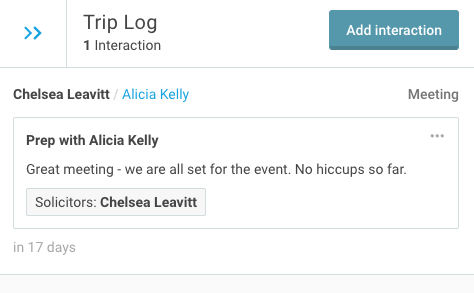 Once your interaction is saved, it will display in both your Trip Log and the constituent's profile as a logged interaction. If your school is importing Proposals, you have the ability to log an interaction right from the proposal itself. Navigate to the desired proposal, and select 'Add Interaction'. The interaction will exist as its own entity while also being associated with a proposal. *If your organization does not currently have the ability to write interactions in EverTrue and you'd like more information, please contact your Customer Success Manager.